The Shetland Island where Fair Isle knitting originated are a small group of islands located about halfway between Norway and Scotland at the intersection of the North Sea and the North Atlantic. In the 9th century the islands were brought under the control of the Norse and remained so until 1648 when they were annexed to Scotland, then becoming a British territory under the Act of Union in 1707. Today the people of the islands consider themselves more Norse then British or Scots. They take pride in their rich Norse history. Knitting on the Island started in the 1500’s. The items for trade include what they termed hosiery trade, that included socks, mittens, gloves, and nightcaps. These garments were probably knit without the color technique that we see today. It wasn’t until the mid 1800’s that we began to see color seep into the knitter’s work. Fair Isle technique refers to using two colors per row. The repeat of the color designs are kept short so there is no need to twist or tangle the yarns. It is easiest to work a Fair Isle pattern by holding a yarn in each hand. This makes the knitting go faster as you are not picking up and dropping a color every time you need to use it. 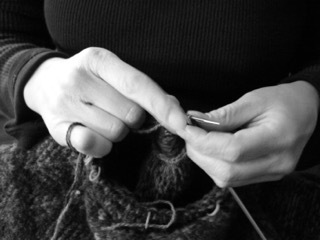 Fair Isle knitting is worked in the round using either double point needles or circular needles. I like using a 12” circular needle for mittens, gloves, and socks; and large circular needles for hats, tams and sweaters. Fair Isle knitting is fun and easy. Come in and we will get you started on your Fair Isle today.